**This is a sponsored post written by myself on behalf of Health Testing Centers. All thoughts are 100% my own. Have you ever felt like your doctor just won't take you seriously? To be honest, I have felt like this often. There are some great doctors out there, for sure, but sadly many of us don't have the chance to see them- be it due to insurance requirements or location. When you have one of those not so great doctors, often times when you have a known condition, it seems like nothing else will be taken into consideration. Or at least, that has been my own experience. You see, I was diagnosed with anxiety MANY years ago, even as a teenager. A few years back my health really started going downhill, so after putting it off as long as I could, I went to my doctor. I had a variety of seemingly unrelated symptoms and a family medical history that could attribute to many of them. All my doctor heard? Anxiety. Every single symptom, with no further testing were attributed to anxiety. It took months to finally have her say she would run some tests AFTER we saw if a new anxiety medication would alleviate any symptoms. It did not, and only worsened the actual anxiety. When I called to schedule again, I was on the final months of my insurance, and was told to wait longer. Something I was no longer at the liberty of doing. Don't get me wrong, anxiety CAN and does cause a lot of physical health issues, but with my personal family history being as it was, it felt like more than anything I was just being brushed off, I wanted that peace of mind to know that there wasn't something else going on. My doctor refused, and kept pushing me off. In my case, I lost insurance before I was able to have testing done. For many others in similar situations, they rack up co-pays for visit after visit just to be given the run around. Wouldn't it be great if *WE* could have a little more control over our own health? If, when in these situations, we could simply order up a test ourselves? With Health Testing Centers, we can do just that! So, what is Health Testing Centers? Health Testing Centers is a mission-driven company on the forefront of transparency and greater control in healthcare through personalized preventive care. Since 1980, the Fort Lauderdale, FL company has enabled consumer access to laboratory testing, including Doctor's oversight, and provided helpful resources for individuals to understand their health data. 100,000 patients served, Health Testing Centers now works nationwide with major laboratories LabCorp and Quest Diagnostics, as well as the premier specialized laboratories to provide an online menu of best-in-class testing options, delivered with a 100% satisfaction guarantee and unparalleled level of service. Health Testing Centers puts YOU in control of your own health. They offer thousands of blood and lab tests available directly to YOU. Simply go onto their website and order your desired tests. There is no need to schedule an appointment with your doctor at all. They work with the largest FDA and CLIA approved labs in the country offering over 3500 locations where you can be tested. The kits will arrive in the mail, and you simply visit one of these approved labs. Easy enough, right? Even better? 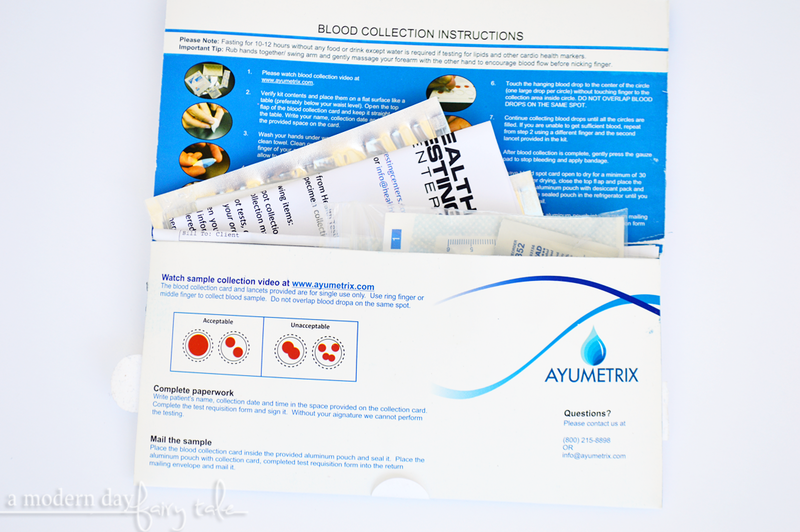 They offer a small selection of tests that you can do on your own at home without even heading to the lab. It also included detailed instructions that you'll want to be certain to read through in order to do the testing correctly AND make sure that you make note of any specific requirements. For example, the tests that I chose required that I fast for 10-12 hours. After you have gone through all of the contents, it's time to do the testing. I'm not going to lie, I was really nervous about this. I'm not a needle person at all, and I worried that I would not be able to bring myself to take the plunge. The included lancet made it very easy. There was no visible needle, just place it on your fingertip (after properly washing and wiping hands with alcohol wipe) and push until it clicks. There will be a pinch, of course, but if you're picturing a typical blood draw, there is no need to worry! Then you just allow the blood to drop onto the provided card. Again, it was a fairly simple process overall. I did learn in retrospect that it is better to have trimmed nails beforehand. I found that if I didn't position my hand just so, the drops would catch in my long nails, and just created more mess and trouble than necessary had I thought of it beforehand. You may find you have to use more than one finger if you cannot get enough blood drops to fill all the necessary spots. They DO provide more than one lancet so that you can do so with a fresh needle each time. Once the testing is done and dried, you simply insert them into the included aluminum pouch, fill out the included paperwork and finally ship it all back in the postage paid envelope that will be included. Very simple! Once the test results are in, you will be emailed with your results. Some results might prompt a phone call to discuss as well. If you've visited a lab, most results will be in within 1-2 day, though there may be more of a wait on some. 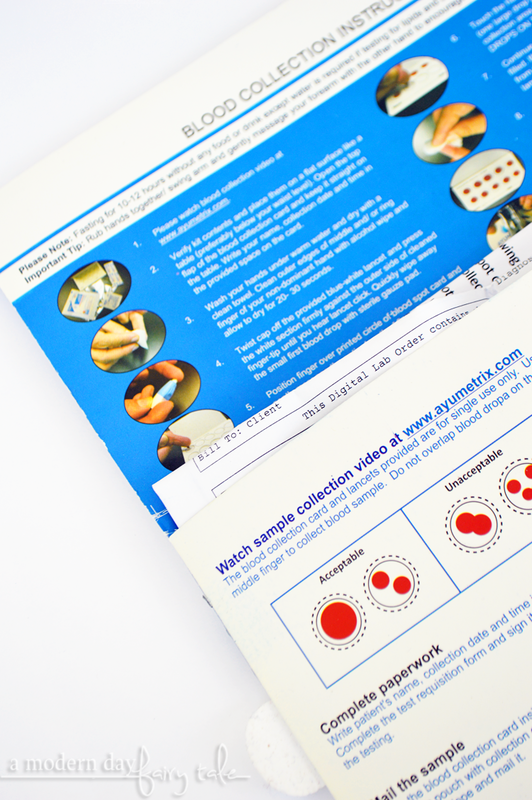 At home tests will take about 1-2 weeks for results, depending on their arrival to the lab. Overall, it was a very quick and mostly pain free process that I would certainly use again and recommend to others as well. For me personally, I love this service because I don't have to wait for the doctor to finally order some tests to give me peace of mind. Perhaps this is the case for you too. Still, it's not the only reason this is a great option. Perhaps you know you need these tests, but don't have insurance and appreciate the lower costs and no doctor's visits required. Or perhaps you are interested in a genetic screening that your insurance might not cover--- such a their genetic cancer screenings. For many it's a matter of discretion and privacy. They do offer drug screenings and STD testing that perhaps you want to keep a little more private. Others like to monitor hormone levels when TTC, etc and want to be able to do so more actively. There are many great reasons that we may choose to use this service, and I for one am glad that this option is available! And right now you can save 10% sitewide at Health Testing Centers with the exclusive coupon code RANDIKAYE. Visit Health Testing Centers today to learn how you can gain more control over your own health! Have you had issues with doctors not taking you seriously, or other reasons why you might want to test on your own/at home? How can Health Testing Centers help YOU?